I voted for Satpal Sidhu for County Council. I recommend that you do too. Not only do I believe he makes a very good County Council member, but I believe his opponent, Kathy Kershner would seriously imperil our water quality and environment if she were to be elected. Here is one example of how Ms. Kershner was willing to put our County’s water quality at risk when she last served on our County Council. 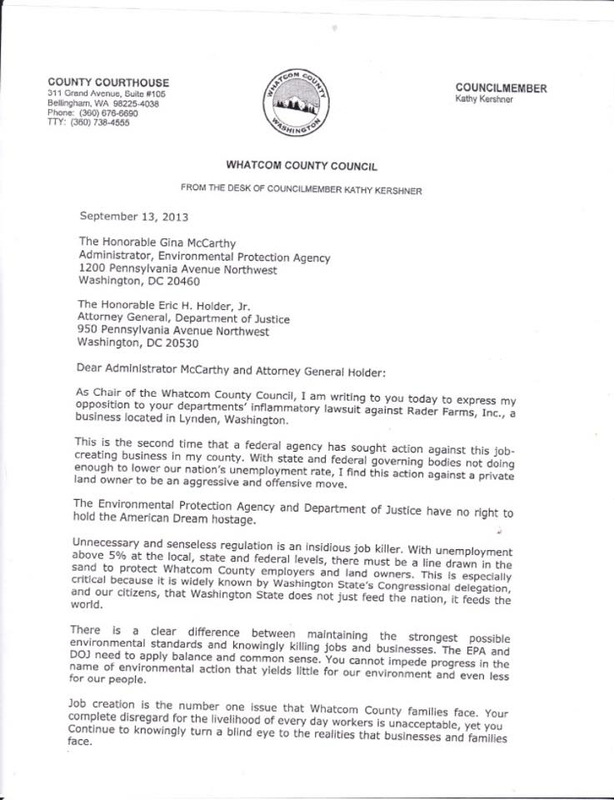 In 2013, when Kathy Kershner was a Whatcom County Councilmember and Chair of the Council, she sent a September 13, 2013 letter (shown in photos) to the Department of Justice and the Environmental Protection Agency, asking them to drop the lawsuit the agencies had filed in 2013 against Rader Farms in Lynden, for its farming operation’s violation of the Clean Water Act, stemming from Rader Farms illegally clearing Category 1 wetlands in 2005, without getting a permit or submitting a plan to Whatcom County. It is worth noting that Sue Rader contributed $900 to Kathy Kershner’s 2013 election campaign on October 28, 2013. So, Ms. Kershner, then Chair of the Whatcom County Council, told agencies which are entrusted to keep our environment protected and our water and air safe, not to do so. And, Ms. Kershner used “jobs” as a justification for ignoring regulations and law. Jobs will come and go, but we only get one environment. 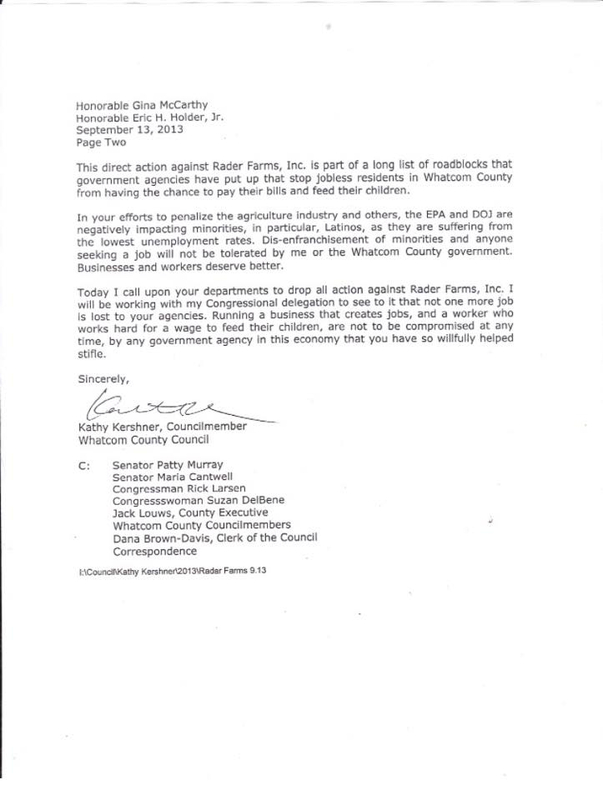 By Ms. Kershner stating that, I believe it gave the letter recipients an implied understanding that she was speaking for the county council, especially because she never states in the letter that she was not speaking for them. everything. . .even our health and safety—and she tried to use her County Council position and political influence when she asked the DOJ and EPA to disregard the law. She had also copied Senators Patty Murray and Maria Cantwell, Congressman Rick Larsen, and Congresswoman Suzan DelBene on her September 13, 2013 letter. This entry was posted in Commentary, Facebook Post, Information and tagged Clean Water Act, Environment, EPA, Kathy Kershner, November 2015 Election, Politics, Rader Farms, Satpal Sidhu, Water Quality, Whatcom County, Whatcom County Council. Bookmark the permalink.